Muffins and baguettes are delicious but not a balanced diet – darn, right? In a world of the Atkins Diet and talk of gluten-free eating, carbs can be thought of as the enemy. There are good carbs. Carbohydrates are also the way your body – and for that matter your little one’s body – gets energy. They’re important. So let’s not write off bread for everyone in the family. That being said, you should know what these terms mean and if the diets are a fit for you and your little ones. For example, Gluten free has become sort of a buzz topic. Most people aren’t bothered by gluten but some with celiac disease have health-related issues as a result of it, according to Dr. Stefano Luccioli, an FDA allergist and immunologist. For these individuals it’s important to know what foods contain gluten. This week the U.S. Food and Drug Administration decided to start a conversation about defining gluten. The issue is it’s a technical question. Gluten is actually proteins that naturally occur in wheat. Lately, people have begun to use the word to describe proteins in other types of grains like rye, barley and crossbreeds. This doesn’t make gluten-free a diet plan nor is it necessary for everyone. Many naturally gluten-free topics are super nutritious though. So maybe you won’t become gluten-free, but it wouldn’t be a bad idea to take advantage of the delicious fruits and veggies naturally in season this summer! With our newfound knowledge, let’s create a yummy summer treat courtesy of GlutenFreeGoddess.blogspot.com. 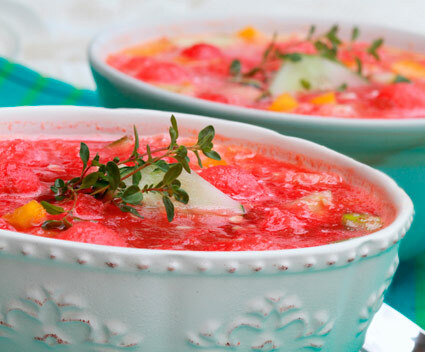 Watermelon gazpacho will be refreshing and tasty. The recipe can be tweaked to meet your needs. Use a larger yellow pepper instead of the lettuce if you like chunkier soup. Try garnishing with chopped red pepper or some Greek yogurt with fresh mint. Slice the watermelon, cut up most of it, taking out the seeds; reserve about 1 cup, diced fine. Toss the cut up watermelon into a Vita-Mix or blender. Add the cucumber, celery, lettuce, tomato and garlic. Pulse and blend the mix briefly to process it. Add the juice from one lime. Add the vinegar, chopped herbs and sea salt. Pulse till combined. Make sure to do a taste test and add a touch of whatever you think it needs – salt, vinegar or even lime juice. Once it’s tasty, pour into a storage container, add the diced watermelon, cover and chill until serving. The soup should be ready in about two hours. You are right that gluten-free shouldn’t be a “diet” or a buzz-word, only known as a celebrity fad. But when 1:133 people are Celiac or gluten-intolerant, that’s not a small number. And 90% of those numbers don’t know what it is that’s bothering them, because the symptoms are so varied and often misdiagnosed. MS, fibromyalgia, Crohn’s Disease, IBS is some of the many diagnoses made in addition to too many simply told its stress or unexplained. It takes an average of 10 yrs for them to be correctly diangnosed. And a majority of those gluten-intolerant or Celiac are also intolerant or allergic to other trigger foods. Very rarely is it JUST a gluten issue. Many examples of restaurant industry workers, family members that don’t/won’t understand have been recorded where if a true “allergy” diagnosis is given, its not serious or real. There are instances where an allergy is life-threatening immediately. But the consequences of being gluten-intolerant are the same as many that are allergic. Headaches, joint pain, brain fogginess, digestive problems, unexplained weight loss are but a few immediate symptoms and when what’s being done internally is understood, a prolonged exposure can eventually result in a multitude of cancers all along the digestive organs and tract. Please don’t downplay Celiac or gluten-intolerance as a minority or “not many people have” category or simply jumping on a “fad”.